Even If Kodak Survives, What About The City It Built: Rochester, NY? 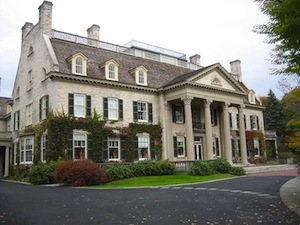 On East Avenue in Rochester, New York – a broad street lined by well-kept lawns during the too-brief summers; a vein of elegance running through a graying landscape – is the George Eastman House. Since shortly after the eponymous man’s death, it’s been maintained as a photography museum but the elegance of the estate overwhelms the exhibits. It’s the place in town where school kids go annually – what the Museum of Natural History is to New York or the Exploratorium is to San Francisco. It’s an anchor point, the high water mark from the flood of affluence that Rochester once saw, thanks in large part to Eastman’s Kodak. The company is now barely avoiding bankruptcy. Kodak and Rochester’s long battle with the metastasizing cancer of modernity appears to be reaching its natural conclusion, though the populace remains resolute. What populace is left. When I was born there, the city was already well into its slide. In 1984, it celebrated its 150th anniversary, its sesquicentennial. For years, I considered that year, my ninth, to be one of the best I’d lived. Why was blurry, except for the memory of a gorgeous summer day spent up near Lake Ontario watching tall ships sailing into the mouth of the Genesee River as a testament to the rich history of the city. Testament to a moment. Do the math quickly. Rochester was founded in 1834, America’s first boomtown, a city that cracked out of the shell of Rochesterville – made fat, wealthy and populous by the Erie Canal. The Canal made all of upstate New York, offering a shipping route that was faster than roads but avoided portage around Niagara Falls. Rochester was “The Young Lion of the West,” then, “the Flour City” for the mills built along the river. In 1838, the city produced more flour than any other city in the country. It was the child of the first Industrial Revolution. Then came railroads, faster and cheaper than the canal, a new era. Rochester stumbled into it. But when George Eastman invented roll film, it began a sprint. The infrastructure the boomtown years created laid a path for the city into the second industrial revolution. Many cities that swell to success during one era shrivel in the next. Rochester made the transition. Downtown, the canal was converted into a subway. Act I, Act II. Kodak was logo for the new era. The company behind the company town. When I was a kid, we’d drive along the ten- (fifteen-? twenty-?) foot walls lining Kodak Park, the sprawling , inscrutable city-within that – movie studio-like – housed the corporation. Acting as sentinel above was the tower – a steeple that resembles a skyscraper topped with a house. On top in bright red neon: KODAK, the word Eastman’s mother made up because he liked the letter K. Kodak, and a handful of other companies, kept Rochester at the front edge of modern America. The city had two Gannett papers. A planetarium. Amusement parks. Mass transit. The Eastman School of Music. Our elementary school (#58, “World of Inquiry”) took kids to downtown’s Midtown Plaza at Christmas, to ride the monorail that made one stop as it circled the second level. Midtown was Rochester’s Epcot, the first indoor mall in the United States, anchored by the “Clock of Nations,” which, every hour, led animatronic Chinamen through a simple dance routine before retiring behind sliding plastic polymer walls. Midtown was built in the early 1960s as an optimistic – and fruitless – declaration of modernity. The papers merged in the 1997. Midtown closed in 2008. The subway stopped service in 1956. Rochester’s population, the stock price of a city, hit its peak six years prior. It couldn’t maintain momentum. Kodak, the innovator, managed to stay ahead of the competition for years. Rochester rooted for it, wondering what was happening behind those high walls, if it would be enough. But then Kodak had to fire people to stay ahead and then it got completely demolished by being a print photo company in a digital camera world. A canal competing with the railroads. The era was over and the new one has moved south and west. Rochester just kept draining. If Kodak collapses, declares bankruptcy, it’s not a signifier of the decline of the city. The city outside Kodak’s high walls already declined. Outside of Kodak Park, people waited for the gates to open and a new salvation to be presented, until they got tired of waiting and moved away. Kodak Park wasn’t a chocolate factory of innovative magic – it was just another Rochester, with a different view of the walls. Unsure and unsteady. The city can’t declare bankruptcy. It will just be – until the last people move out and the stock hits zero. Rochesterville. It is always easy for the richest man in town to call it a day.